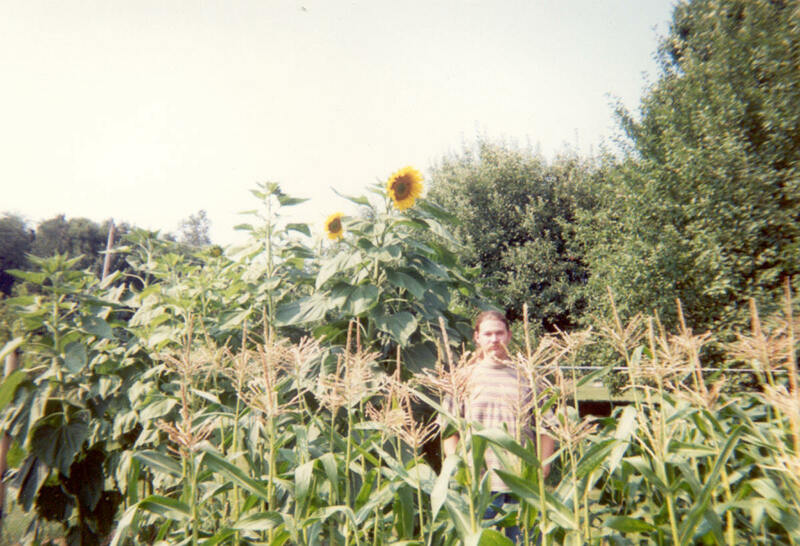 Once upon a time, my husband and I lived on a small New England farm. 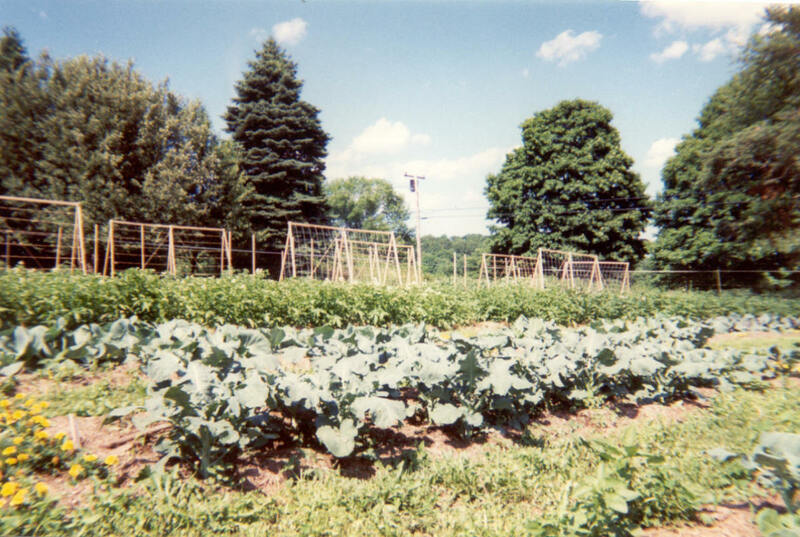 And on that farm we had a garden full of organic vegetables. 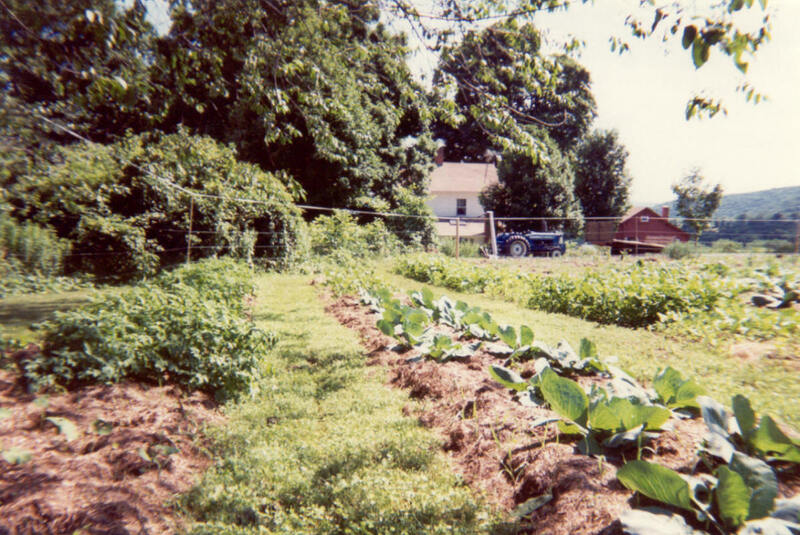 Intending to grow only what we needed for ourselves but being new to gardening and not confident in the greenness of our thumbs, we not only tilled far more ground than necessary and planted more seeds and seedlings than necessary but, by george, it all grew! Needless to say, we had vegetables of all kinds -- some we had no idea what to do with (kohlrabi?) -- coming out our ears. 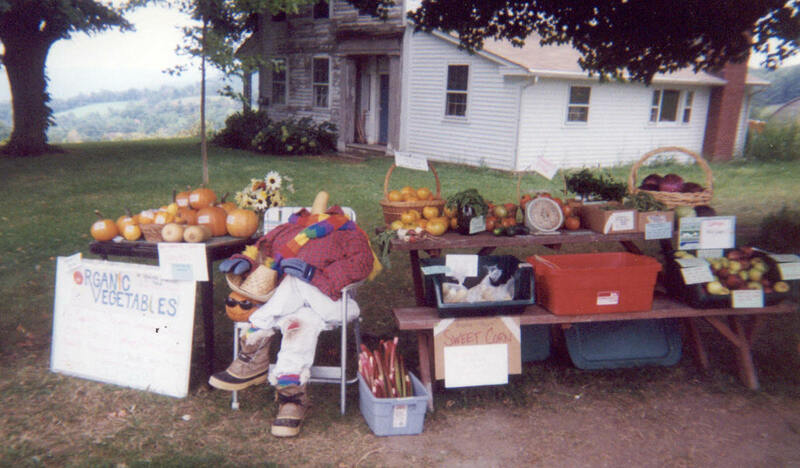 So we gave some away, traded vegetables for farm products we didn't grow or raise, and, when we still found ourselves with excess, we set up a self-serve stand out in front of the farmhouse (complete with "The Headless Harvester" pictured here, who had butternut squash for a neck). Finding the self-serve produce stand to be a success and enjoying meeting new people when we happened to be nearby when they'd stop, we took a friend's advice and signed up for a booth at the local farmer's market. 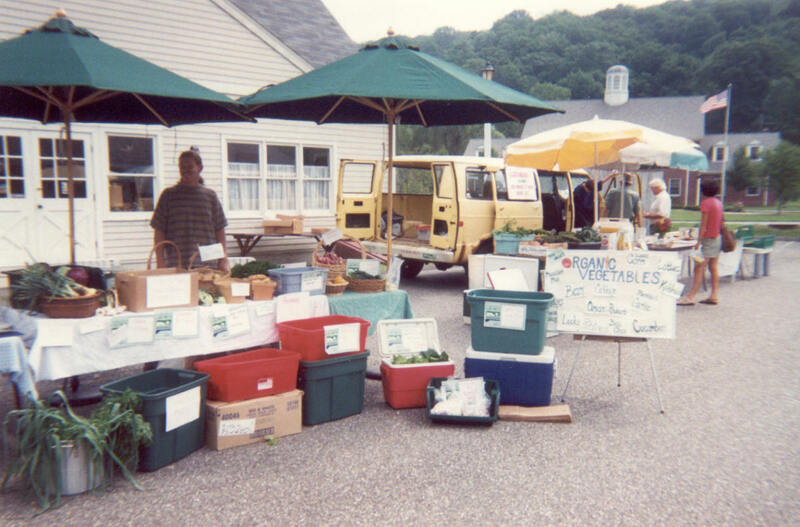 Some of the photos you'll see here are from our early days of selling produce, before we got better at making our displays look tastier and more inviting. But, over time, we improved our farmers market tables and our sales, and I'd like to share with you my tips for making at least some extra spending money, not to mention pay for next year's seeds, by selling what you grow. Broccoli, onions, beans, oh my! And lettuce and tomatoes, squash and cucumbers, peppers, herbs, cabbage and potatoes. Out of the ground also came garlic and turnips, carrots and celery and ... well, let's just say I made good use of my Victory Garden Cookbook, to make use of all that fresh produce. Matter of fact, I think I saw a neighbor duck inside and pull the curtains when she saw me coming with an another arm-full of zucchini. I LOVE this cookbook. It saved us from yet another night of steamed broccoli. And my husband was about to go on a hunger strike if I made one more vegetable stir fry. But then I bought this book, and a veggie wasn't just a veggie anymore. This, to me, is a vegetable grower's must-have recipe book. It's been around a while -- since 1982 -- and is still a best-seller for good reason. Sure, you can find a gazillion vegetable-based recipes online, but there's something about sitting in your favorite chair or outside, perhaps while gazing at your garden, and flipping through a classic cookbook with lots of tasty looking photos. This classic cookbook makes a great gift for any gardener, too. You don't have to be a gardener to wear out the pages of this book, which grew out of a public television series called The Victory Garden. It was a how-to program aimed at home gardeners, with a recipe segment thrown in in each episode. Pay-and-take on our customers' honor worked very well for us. So, after the neighbors starting politely declining our plethora of free produce, we took to the street. We figured, well, if people just take the extra vegetables and fruit, that's fine. But we posted some prices per piece or per pound, bought an inexpensive food scale, set that scale out along with saved grocery bags and baggies, and placed a shoe box on the table with several dollars of "seed money" inside for making change. Then we went about our business of tending to the farm and running errands. The evening of our first day as bona fide market gardeners, as we were heading back to the house, I noticed that our vegetable stand was looking a bit ... sparse? I hurried over and, to my delight, found the shoebox was full of green! There was even a note from a lovely gentleman, with his name and phone number, saying he'd return the next day with the additional $2 he owed for the tomatoes! 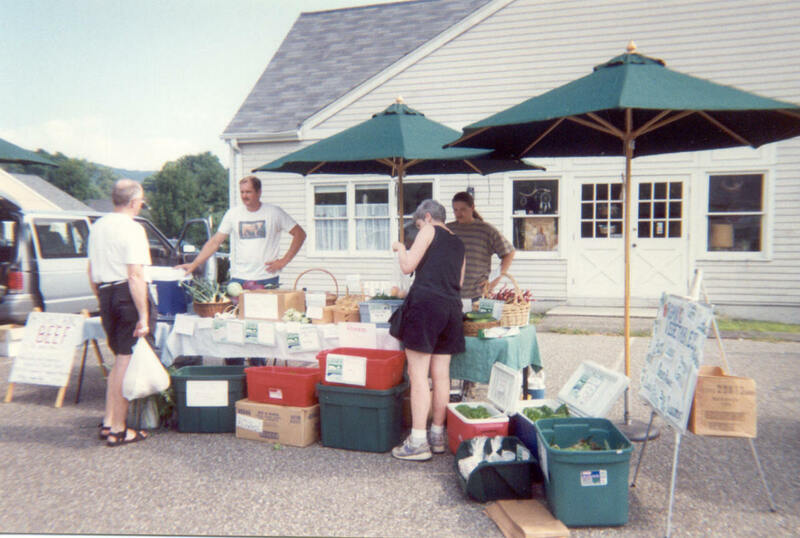 The following spring, as our garden once more looked on the verge of exploding with organic produce, we paid $30 for a spot at the local farmers market in Kent, Connecticut (small town, very inexpensive booth space, at least back then). And when the lettuce, spinach and other early veggies began making their appearances, we grabbed our old card table, miscellaneous baskets and plastic bins, some plastic baggies and an old dry-erase board we had lying around, and off to market we went. Our produce table was pathetic. As other growers set up their booths, we looked from their displays to ours and back again, and felt like kids with a lettuce stand. So, as buyers began to trickle in, we outdid ourselves with niceness and, despite our sad little table, we sold every last head and leaf of lettuce. At the end of the afternoon, we had enough money to go celebrate our farmers market premier with pizza, then buy a few things to help spruce up our table for the following week. First things first, though: Before any decorating or other display ideas, I say that working the booth is number one. By that, I mean both interacting with shoppers and continually keeping your display neat, clean and looking nice, even if it's very basic. As people buy and produce goes home with them, fill in the gaps on your table, either with extra stock or simply by rearranging what's left, and, if need be, offer some late discounts to last-minute customers. Unless, of course, you want to go home with all the leftovers (which we'd usually preserve or share with the pigs). Fun, friendly conversation with customers really made all the difference for us, even more so than anything we did to our display. Your farmers market table can be a work of art. Just by laying around, being themselves, vegetables and fruits are pretty to look at, so making colorful produce displays certainly isn't hard. But be mindful of presentation when setting up your farmers market table. 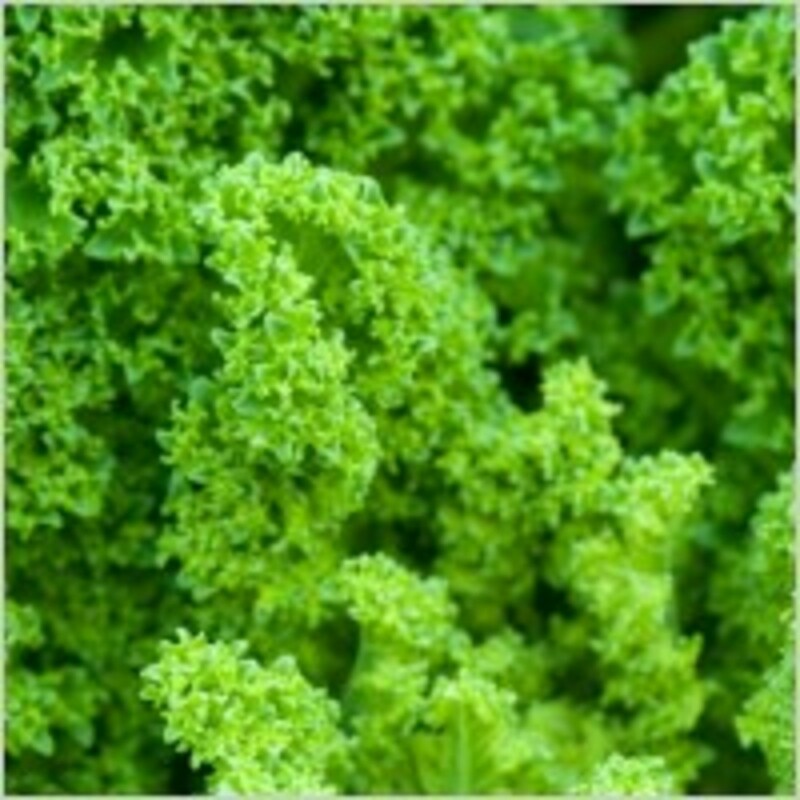 That is, you might not want to group everything green together but, rather, separate greens with oranges (like tomatoes) and reds (such as strawberries and red peppers). Bunched radishes are great for adding a splash of color variety here and there, and mix up the various shapes, sizes and colors of squash and pumpkin. I say, treat your table like an artist's canvas and paint the most eye-catching picture you can with your produce. 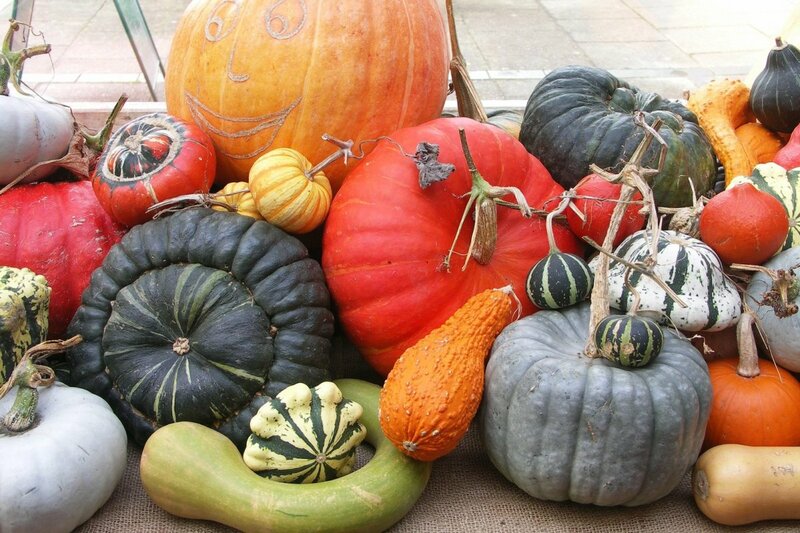 Display your produce the countrified way. 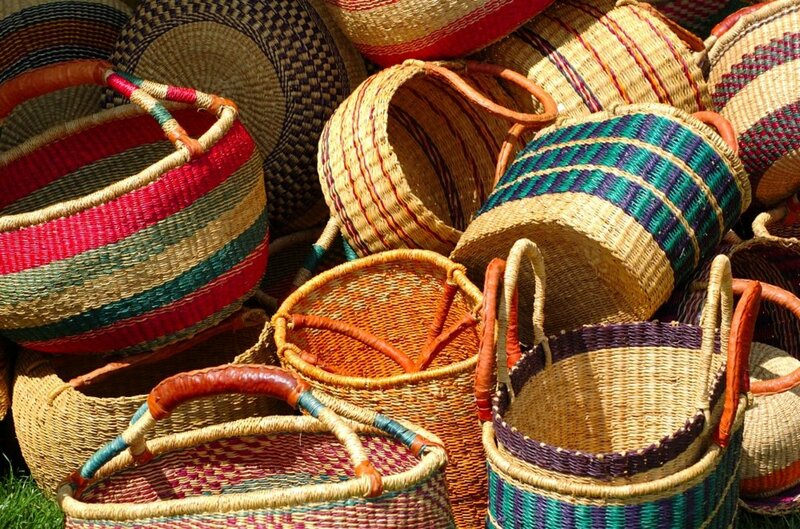 Woven baskets sure look better than cardboard boxes and plastic bins for displaying produce; although, we used the latter two on our table, along with stock pots and buckets, when we first started selling at the farmers market. As weeks went by, however, I collected dozens of fun baskets, some for just a dollar or less at garage sales and flea markets and some for free, from neighbors and friends who had unused baskets lying around in garages, barns and closets, that they were happy to donate or at least loan to the cause. I've also found free baskets on Craigslist and Freecycle.com. I'd often line my smaller baskets with cloth napkins to absorb moisture and for an extra added touch of country. Rustic wooden boxes and crates also make attractive containers, particularly for large quantities of an item, such as green beans and baking potatoes. 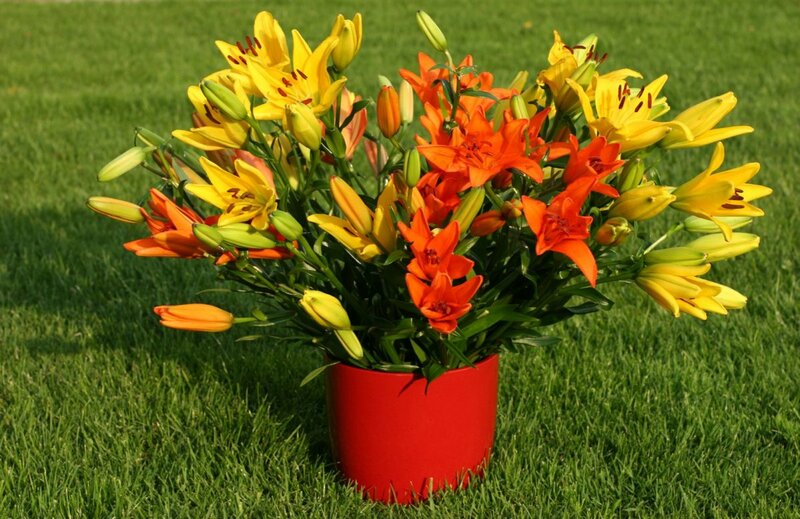 Decorate and sell as bunches or singles. We not only combined flowers, like marigolds and nasturtiums, with our vegetables for companion planting as a means of organic pest control, but we also grew flowers to decorate and sell at the farmers market. Sunflowers, which come in a variety of sizes and colors, were not only easy to grow once they got started, but were a big hit at the market. We grouped flower arrangements in various places throughout our display and often that was the first thing shoppers commented on when they approached the table. Of course, those arrangements were also for sale, as were vases full of flowers that could be bought as singles, and we rarely had any left at the end of the day. Just about any table or makeshift stands will do for the farmers market, but covering them with pretty, countrified cloths makes your display look more uniform and attractive. In our early days at the farmers market, we used a combination of old card tables and plywood on top of stacked cinderblocks to create our stand. And, in our first week, we actually used some old but clean sheets-turned-table cloths to cover them up. And they didn't look bad at all. Eventually, though, we spent some of our earnings on good ol' red-checkered cloths, not to mention better tables. Table cloths, if long enough, also help to hide extra stock and supplies stored under your table. Yes, this is a pretty basic checkered table covering, but that's the look I like for the market: simple and countrified. Or if you are really keeping to a tight budget and have an old but pretty flat sheet around, maybe with a floral print, that will do as well. I think it partly depends on what the sellers around you are using. Some farmers markets are more ... shall we say, formal and "foofy" than others. In that case, I'd opt for a regular table cloth rather than a sheet. This was a big selling point for us, particularly when it came to garlic, onions and spicy peppers. In addition to selling singles, to be purchased by the piece or the pound (or part of a pound), we made braids of onions and garlic and "ristras" from the peppers. We'd create varied lengths and quantities, to give the customers more choice (especially the early birds) and even sometimes mixed the varieties, combining yellow, white and purple onions, for example, in one braid. We also made some wreaths out of these vegetables. Though that took more time and effort and the results were priced higher than the braid and ristras, we always sold out. The nice thing about these "crafted" vegetables was, if we didn't sell them all one week (which we usually did), they'd be fine to sell the next. After all, dried ristras are often used simply as decoration. They also added some pop to our display, though we had to improvise ways to hang them. Add even more interest to your farmer's market display. This was a fun way to sell brussel sprouts, not to mention a perfect way to store them in a root cellar--right on the stalk. We even added these stalks of sprouts to flower arrangements on our farmers market table, and promoted them as interesting candidates for late summer and early fall centerpieces for customers' country-style dinner parties. 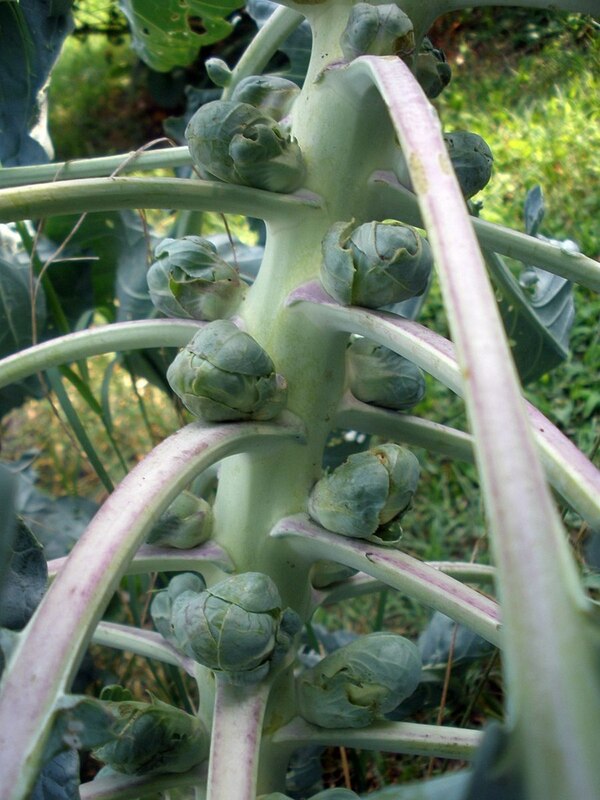 In fact, these on-the-stalk displays were so popular, some people who bought them said they didn't even like Brussels sprouts; they just liked the look of the stalks and hadn't ever seen how they grew. Kohlrabi was another vegetable we sold on the stalk, as well as some tomatoes on the vine. 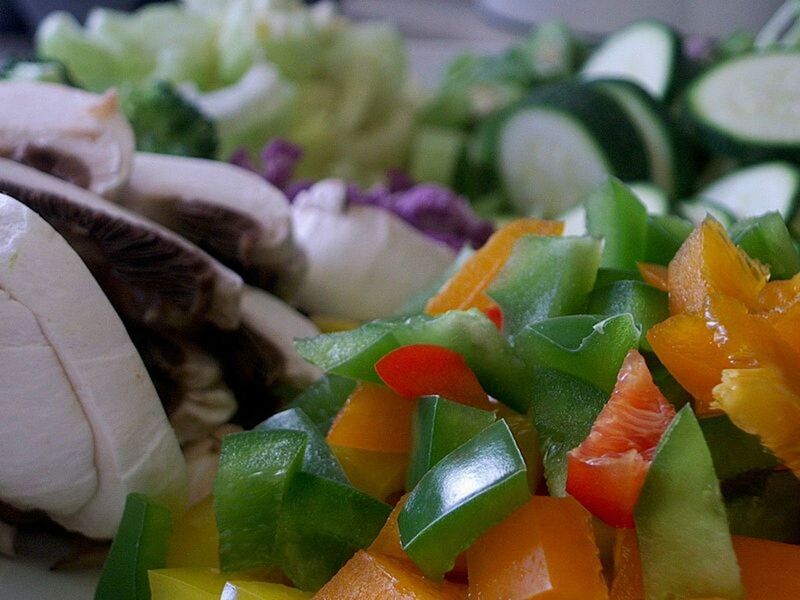 Take some of the work out of your customers' food preparation. In addition to selling produce "as is," you might want to try doing a little chopping and mixing, which will also add some dollars to your farmers market earnings. For example, we had great luck with baggies full of chopped cabbage, carrots and onion a la coleslaw mix. Chopped stir fry veggies and dry soup mixes were also a hit. Mixed dry beans were another value-added homegrown product that sold extremely well--combinations of dried pinto, black, navy, anasazi, red, garbanzo, lima and/or kidney beans. With all of these pre-chopped and mixed items, we included a handwritten recipe card, stapled right onto each baggie. Tasty ideas will encourage people to buy the ingredients. As with the value-added produce, we also offered free recipe cards for all of our less common (or less popular) fruits and vegetables, including things like rhubarb, kohlrabi, kale and quince. Oftentimes, shoppers would be perusing our display and ask, "What's this?" 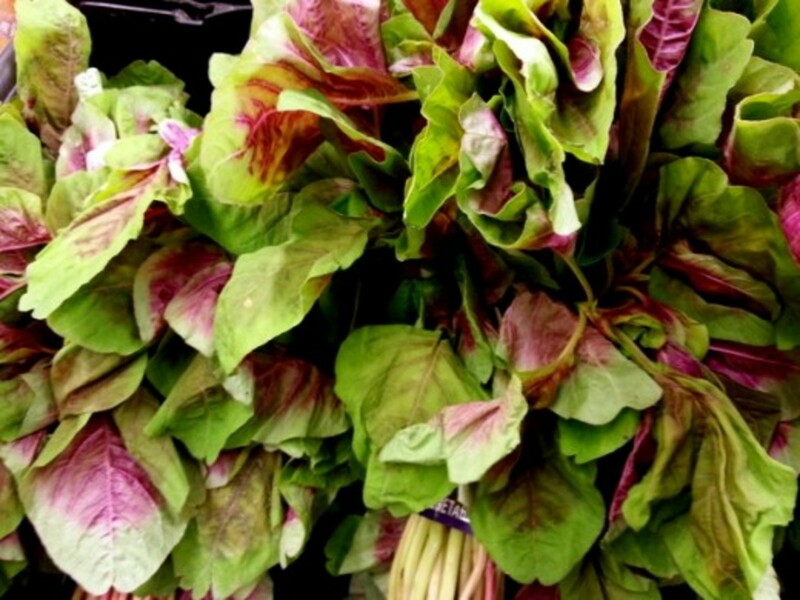 while holding up a vegetable or variety they'd never seen before, or one they'd seen in the grocery store but never had anyone around to ask what to do with it. So be prepared with cooking tips and recipe suggestions for all of your produce. Those questions about uncommon fruits and vegetables nearly always turned into fun conversations, complete with those free recipe cards. More often than not, the customer went home with something new to try. And, many times, those same customers would return the following week to buy even more. Make it easy and even more appealing to your customers. Another idea for your farmers market table is to group some of your fruits and vegetables according to what one can make with them. For example, why not take some of your sauce tomatoes, garlic, onions and bunches of fresh basil and set them a bit apart as a group, along with a sign that says something like, "Ingredients for your own homemade tomato sauce," and put out some recipe cards too. Depending on how much sauce the customer might want to make, you can help them select the right amount of each ingredient. Perhaps you might even price that sauce combination as a group by weight. You might even have a "recipe of the week" that you customers can look forward to, and each week have the ingredients you grow set aside along with a catchy sign with the name of the dish. And don't forget about growing some of the herbs for these recipes as well. A little taste can go a long way. We saw other sellers doing this and soon followed suit, and our sales increased even more. 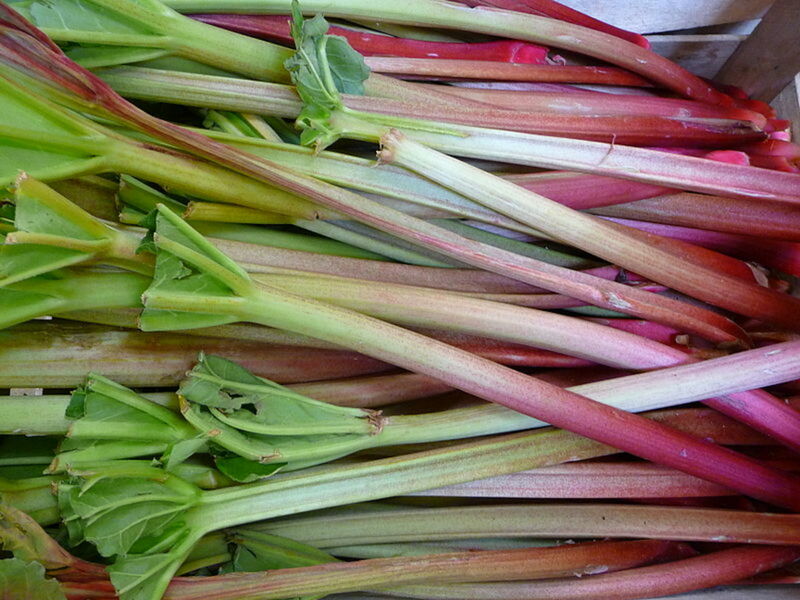 One of our first freebies was a little refreshment--a cup (or two or three) of what we called "rhubarb ade" to anyone wanting a taste. It was my husband's concoction: pureed rhubarb pressed through a cheesecloth, with water and sugar added to taste. We'd set out our pink drink in a large punch bowl, with ice and a ladel and a stack of small paper cups for shoppers to help themselves. Throughout the rest of the summer, we offered a different sample each week, including slices of zucchini and pumpkin bread, roasted garlic, sliced tomatoes with basil, homemade coleslaw, and grilled and seasoned mixed vegetables. The ideas are nearly endless. We did find, though, that the most convenient samples were those that could be eaten with the fingers or on toothpicks, cutting down the cost for small, plastic utensils, not to mention the waste. Offering free samples is a great way to draw shoppers to your table and show off how tasty your homegrown fruits and veggies really are. Consider offering online pre-sales for customers with just a little time on their lunch hours or who can only swing by at the end of the day. Here's an interesting article from Small Farm Central. Here are a couple of books I've used and recommend. Part 1 covers selling at a farmers' market, offering advice on choosing crops and products, keeping records, staffing a booth, setting prices, setting up displays and merchandise, and using color and texture to enhance visual appeal. Part 2 gives information on starting a neighborhood market, attracting sellers, market demographics, advertising, publicity, tastings and other special events. Location, timing and day-to-day concerns also are discussed. Part 3 deals with such topics as social issues and websites. Also, in five appendices, the authors discuss insurance, a market study, customer surveys, market profitability, and benefits. In this cookbook, you ll find a wealth of inspired creations. Selection and storage tips are included, along with color photographs. Among the 75 tempting dishes are Fingerling Potato Salad With Fennel, White Peaches in Raspberry Wine Sauce, Apple and Dried Cherry Crisp, Radicchio With Raisins and Pine Nuts, and Penne With Broccoli Sauce. 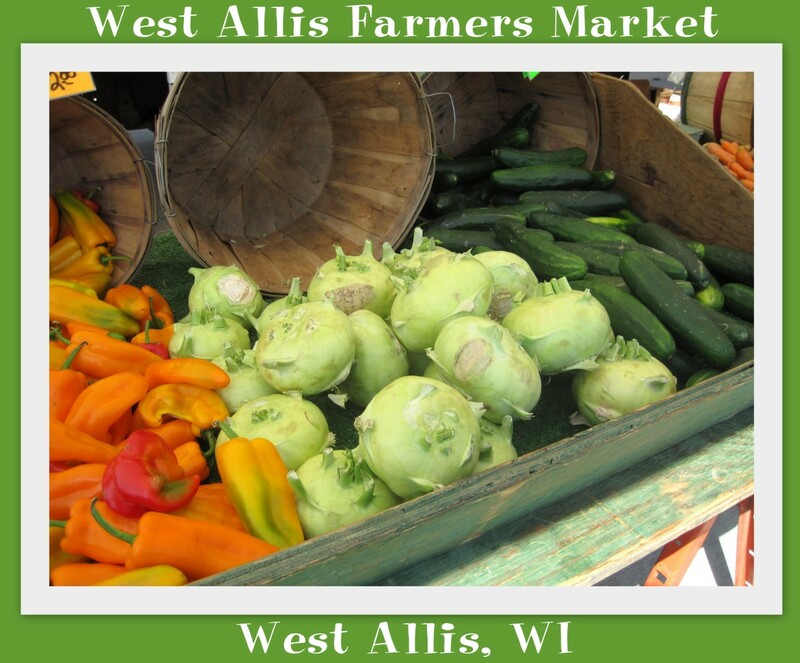 Locate a farmer's market near where you live or where you'll be traveling. Do a Farmer's Market Search on the U.S. Department of Agriculture website. 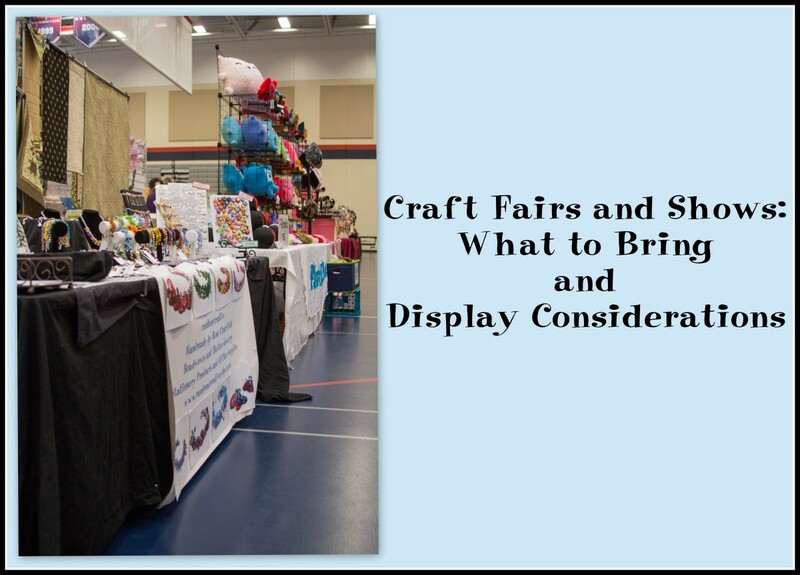 Do you have any additional ideas to share to help others spruce up their farmers market booth and increase sales? Please leave your comments in the guestbook below. 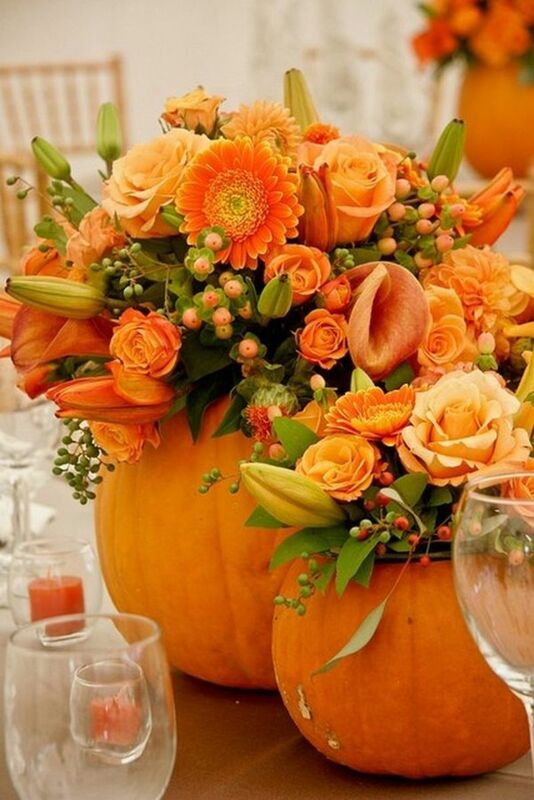 How to Make Beautiful Flower Arrangements? I'm thinking about setting up at table in our small town on Saturdays, I often have more than I can can/freeze/use in a season and I could pick up a little spending money. Going to try a vertical garden to get more harvest per square foot. Wish me luck! Love farmers markets, what a wonderful lens. That intro pic is so funnny. I love a good farmers market! Interesting lens with great tips! We love going to farmers markets. I enjoy buying from our local farmer's market and from different roadside stands. I also grow some of my own vegetables. Thanks for sharing this great information. We have a self-serve stand in our neighborhood, and it's nice to stop by every once in a while and pick up some fresh produce from them. Great job on this lens! This is a great lens. One of my very favorite things is visiting farmers markets and yes, it is always great to visit tables where they have put some thought into it. My boyfriend and I are planning to have a stand at the farmers market soon. We will be selling landscape and house plants. I make decorative wooden signs for the garden, so I will be taking those along too. I think they will make a nice addition to the offerings. I loved your lens. Very useful suggestions. kohl rabi is lovely - grate in salad or cook and mash like potatoes. I prefer it raw. And it's so pretty - just like a little sputnik! I buy most of my veggies and some fruit from a local farmers market that is open here all year. You can't beat the taste, and it's nice to support a local business. Nothing is better than fresh berries directly from the farm! I get their frozen ones off season. I have a quest! It's to recommend an inspiring lens. Consider yourself recommended. I'm just starting off in the world of farmers' markets so this is GREAT! Thank you so much - I've bookmarked it to go back to. We love stopping at roadside stands! I love buying produce at the market. I prefer to give my money to local farmers instead of large grocery stores. The produce is often fresher and yummier anyway. I love the pre-shredded coleslaw mix idea above too. You get a like for the Headless Harvester alone! lol Looks very laid back... Wonderful lens. @David Stone1: Great suggestion, Dave! Thank you. Can't think of anything much to share. This is so thorough and well illustrated. But, as a vendor at arts and crafts fairs, I'd say virtually all these points apply to our open air markets too. Very helpful. One thing I didn't see and some might consider is a last hour closing up sale. Some vendors, especially the farmers market vendors who join in our fairs, offer drastic discounts to move perishable products in the last hour, going from table to table and letting other vendors know. Most customers are gone by then, and it's a good time to move product and, for us, to do some convenient, discount shopping. Looks like so much fun! There is something so satisfying about growing and selling your own produce. Well done! A really good article! All your good ideas must have attracted a lot of visitors to your stand! We have a veggie garden and this year are growing tromboncino squash for the first time. One baby squash so far. Fortunately we have enough room and a sturdy trellis for them! If I have too many I hope my neighbor who has a stand at the local farmer's market will be willing to accept them as a gift to sell at her stand. this is the 1st year a brother and i have gotten together and rented land for a garden, there's plenty planted ( far more than whats needed for the 2 families) so now i am checking out idea's for the market, seeing that this is a switch, we are the ones usually buying and now we will be selling, i have been to the local farmer's market and have bought from roadside stands before. I keep coming back to this lens...thanks! I'm just blown away by this fabulous lens. It kept me reading and thinking for half an hour. I love the idea of also sharing recipes along with the produce for sale. Congratulations on your purple star. really super job. Blessed. Cool Lens! !I enjoyed reading! Youâve inspired me to start my own project! I prefer eating vegetables than meat that's why I get attracted to topics concerning vegetables. Thanks for sharing your experience and ideas. Hi I enjoyed reading your lens, I know all about planting too much, and wondering what you are going to do with it all. I just love gardening and all the fresh veggie and fruit. I might be setting up my own Stand, thank for sharing. I always try to buy from local growers if I can and I love fresh veggies. I have a vegetable and herb garden of my own and I buy from an organic food coop twice a month. I think it's really important to support local farmers. Wonderful lens. 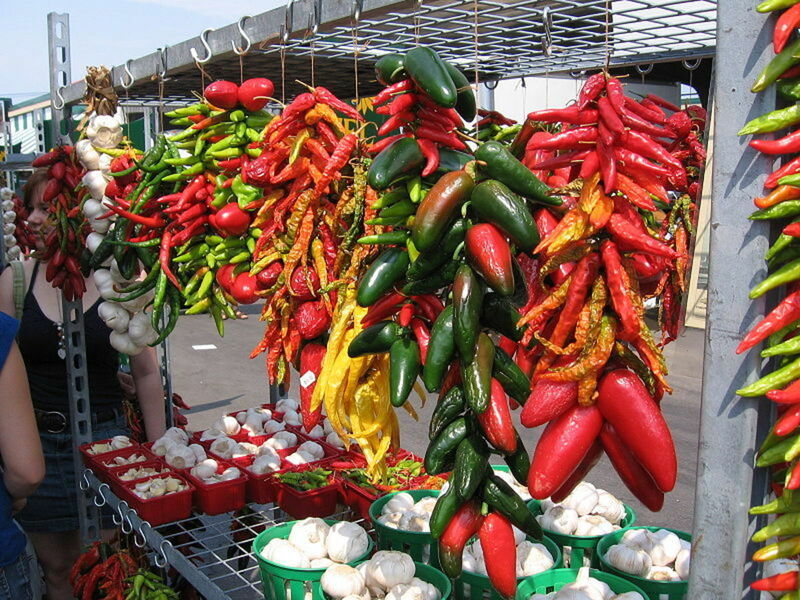 I always tend to buy from a roadside stand or even a farmer"s market vendor. I will soon set up my own farmer's market stand. This is a wonderful lens. So pretty, and you chose really good products to feature. I loved your personal stories. Angel Blessed! Pinned to my board "How does Your Garden Grow?" Great leans, I love your tips! What great ideas! My girlfriend and I are hoping to move to the country and possibly even start a hobby-farm in a couple years. It's nice to see how to make it work! 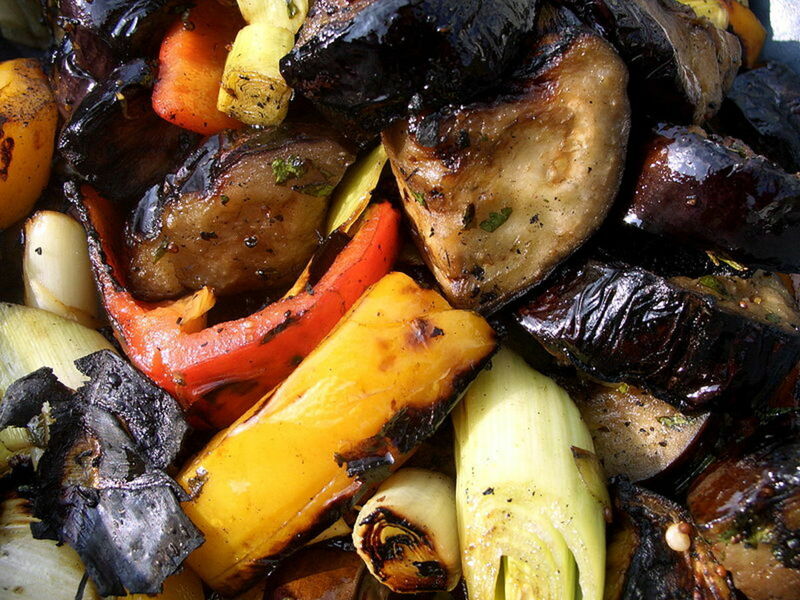 I also love the idea of grouping veggies by recipe. I don't know how many times I've had to buy huge quantities of one veggie just to use some of it in one recipe and the rest would go bad before I had time to use it again. Thanks much! Very nice educational and informative lense. Love the herbs garden. Farmer's markets are great. So I'm glad to see these tips. Thank you for publishing this lens. missing paper bags:)great lens!I love home-grown vegetables. great lens.love the tips. AND LOVE recipe cards. Wow! Great lens! Thanks for all the great information. Enjoyed my time at the market. Beautifully displayed. Awesome lens! I don't have a farm stand (or even a garden at this point, unless you count carrots planted in old pop bottles), but my mom does, so I'll be passing this along to her. Excellent! Very interesting and informative. 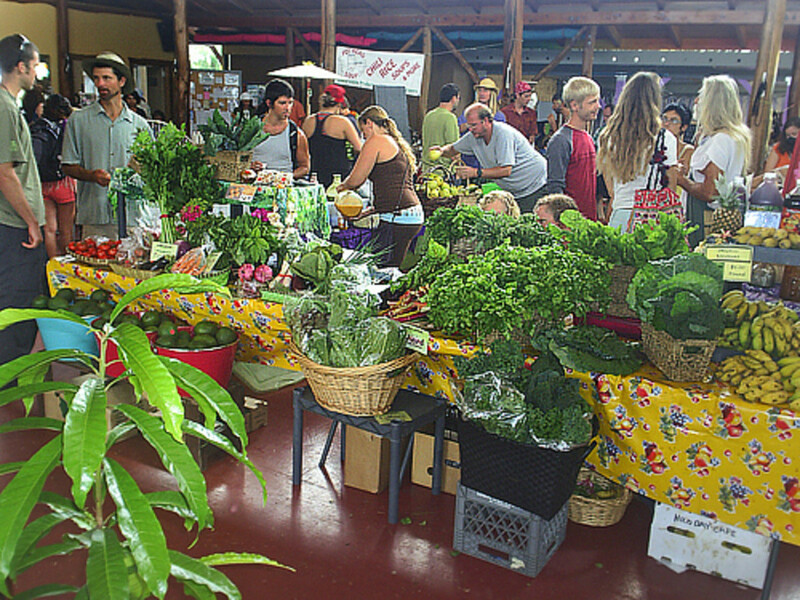 I grew up on a farm and enjoy farmers' markets as a link to the farm years in my life. Great tips. Thank you! I'm hoping to have enough excess produce this season to begin selling both veggies and cut flowers at city markets. Organic farming is something to which I aspire. Great ideas. Can't wait to try them at my next event. Nice sharing, good tips you have provided for farm market. fresh fruits can be achive by planting fruits in home, your provided ideas helps alot in this regard. I absolutely ADORE farmer's markets! Last time we were in the states (Aug) we went to the BIG farmer's market in Syracuse.. oh What FUN!!!!! Blessed! I love doing farmers' markets! I actually enjoy that more than doing craft shows, as my fellow vendors are a bit friendlier and not so competitive with each other. Having samples definitely helps to make more sales. Love your other ideas too. 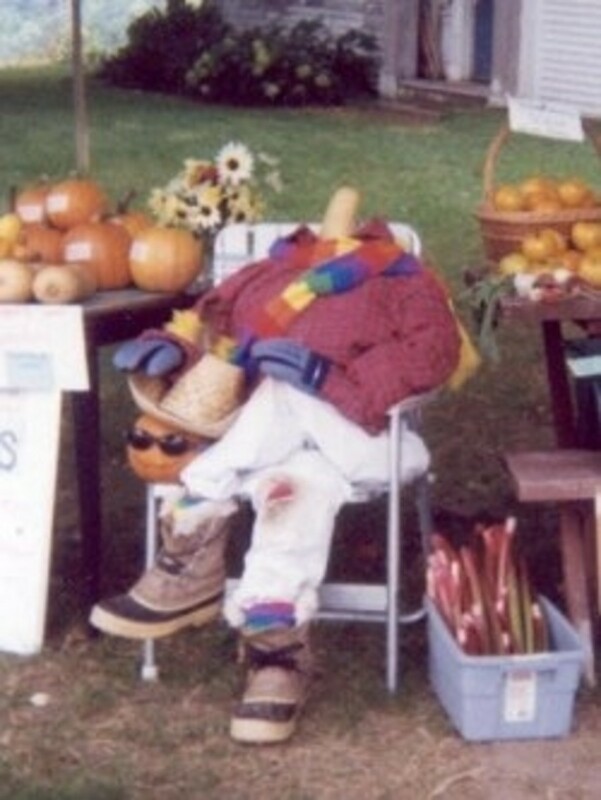 Love your headless gardener!! He would definitely draw attention! I love shopping at local farmers markets. I end up eating healthier and better for it as well! I stopped by as I love Farmers Markets and as I read I realized I'd been here before. On a search I found myself as my original alter ego before I changed my Squidoo name. So, here I am as your 'Elf' friend coming back as I'm on a self-quest of reading about zucchini today to celebrate 'National Zucchini Bread Day'! We often go to farmers market even when we travel, we seek them out. I just find this very interesting. I live in the city, but every Saturday is farmer market on in the town and I always truly enjoyed that. Great lens! I really enjoyed reading it. Some of the most interesting displays I've ever seen have been at the farmers market. Great info! What a fun article to read! It sounds like your accidental produce stand did very well. This is so cool - your self-serve vegetable stand! We joke about opening a "honey u-pick" (beekeepers have a weird sense of what's funny) but do have a roadside honey stand that works on the "honor system" - we put out jars of honey at the stand, and people who stop to buy just put the money through a slot in the table, into a cash box mounted underneath. Every year, we come out ahead by a couple of dollars more than the value of the honey - restores my faith in human nature! Amazing lens ! Nice post. Very colorful and informative lens ... thanks for the helpful tips. Adorable ideas for sprucing up a produce stand! Presentation makes such a difference... even seems to make the food taste better! Nice Lens, thanks for sharing it. Stop by and take a look at my post we have a lot in common. Very informative lens. Great job! This is a great lens! I am planning to set up a booth this summer at our local farmers market. You gave me a lot of good ideas and some things to think about. I never thought of doing things like adding recipes and value added items. I love shopping a farmers markets. The produce is so fresh. Love the intro pic! Great lens and very important info as food prices rise and inflation is sure to keep increasing. My friend and I are thinking of selling at the farmer's market, but our crafts. I'm sure between the 2 of our gardens we also will have some food products as well as some homemade cookies, muffins and the like too. Right now we are talking about it, haven't paid membership or space fees yet. Nice lens! We have a farmer's market here in town and I was thinking about setting up a table next year. Bookmarking your lens for your great tips. Blessed. This is soooo cool!!! I sent it to my husband and told him "I need to do this". Thanks for the lens!!! Nicely done. I really enjoyed the pictures and layout of your lens. Ramkitten, very informative, eye-opening lens! You certainly have a depth of knowledge on this field. I love buying fresh fruits and vegetables from farm markets. You just can't compare the quality of local produce with that which has been shipped for thousands of kilometres from another country to a grocery store. You write very well! Thanks for posting this. very enjoyable read! and full of great ideas for decorating! We're hoping to do a farmer's market themed wedding reception for my daughter soon, and the photos and suggestions will easily translate into decorating ideas for her special day. We don't grow any veggies, but do intend to start buying them from a farmers market rather than from the local store. So, when I sAw your title on a search, i had to come see. Thanks for the great tips and advice. Will definitely make good use of it. Hey Deb we went to view our dream farm last night, it has its very own orchard, plums pears, and vegetable patch! I remember reading about your farmers makret and wanted to come back, get some ideas as we put together a plan, and see if we can really do something. mpstly the land is DIY livery however i would love this sort of idea as the farmers markets in our area are great! If i could bless this again I would! What fabulous ideas! Blessed and added to my Growing Vegetables and Herbs lens. 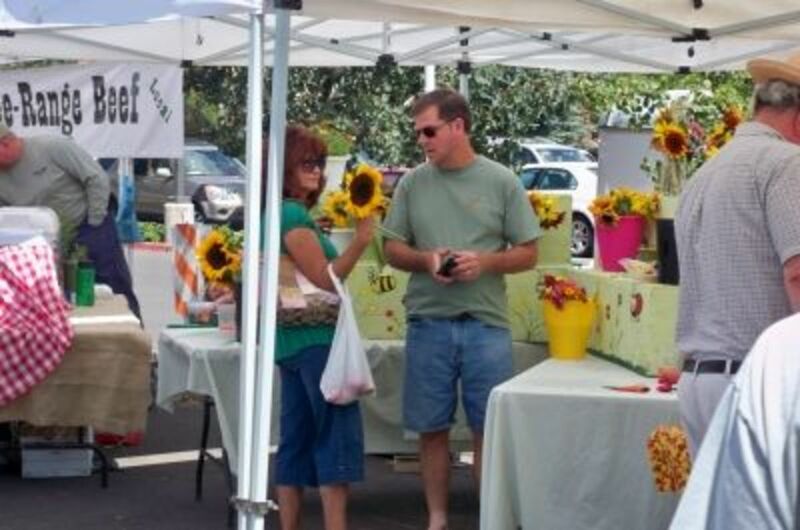 You've done a great job telling how to succeed with a farmer's market booth. I think interacting with the customers for a personal touch is important to draw customers in to return week-after-week to your booth. Blessed by a squid angel and featured on You've Been Blessed.